The Best Health and Wellness Expo! Shape Up Arizona Joins Chandler’s Day of Play for SHAPE UP to LIVE FIT. It is a FREE family, fit, and fun day. Through this state-by-state wellness fair Shape Up US helps families and teachers assess and address their personal and community wellness needs. Meet and Enjoy: Amanda Borden Olympic Gold Medalist, NFL Alumni, Tug-of War, Mascots Olympics, Phoenix Cardinals, Inflatable’s, Hip Hop Star Eric James, 5K Run, Prizes & Giveaways, Healthy Cook-Off with AZ Barbeque, Healthy U TV and Sunflower Market and so much more . . .
Are You Arizona’s Healthiest Family? 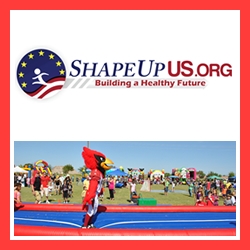 Shape Up Arizona and Arizona Parenting Magazine want to find YOU and recognize YOU for your healthy lifestyle achievements. Does your family have what it takes? To enter the contest, click here: http://www.shapeupus.org/healthiest-family-contest and complete the informational questionnaire covering the seven areas.